L'escapade idéale ISLAND: Magnifique bord de mer villa de deux chambres avec des chambres séparées par le salon et la cuisine. Situé à l'extrémité méridionale de Hilton Head Island. Hors des sentiers battus par rapport aux autres parties de Hilton Head rendant beaucoup moins fréquentée. En face de South Beach Marina, Salty Dog Cafe, magasins, restaurants, etc. Plages plates longues encouragent promenades, des chasses de coquille de mer, observation des dauphins et des promenades coucher du soleil. Parce que les plages sont à l'intérieur Sea Pines Plantation, ils ne sont jamais bondées. Miles de pistes cyclables, Trophée de golf, des courts de tennis abondantes et un certain nombre de restaurants à tous les niveaux de prix en fait un endroit idéal pour les couples ou les familles. Société de gestion locale assure que toute et toutes les demandes sont traitées rapidement. Keys, passes des plantations et des informations supplémentaires sont obtenus à un chèque de 24 heures dans un bureau. I have stayed at the Beach Tennis resort many times. This is my go to place. Convenient to all the best restaurants yet far enough down the island to get away from the traffic. The condo is perfect. The view is great. Plenty of patio room. The pool is very nice and clean. The only thing we noticed was there weren’t any window coverings in the main room. It didn’t bother us but some might like more privacy. First, thank you for your review. It is good to have feedback on the property. we are in the process of removing the slatted window covering, and replacing with drapes. The slats tended to break off and were not effective. In making the change, the drapes were not ready after the slats were removed. This problem should be resolved shortly. I am pleased you enjoyed the stay. I look forward to accommodating you on a future stay. Although the view was pretty, the condo was standard and seemed in need of some sprucing up. The kitchen seemed to be equipped, though we didn't cook. We were happy to find a coffee maker with a reusable filter in the cabinet. On the down side, the hodge-podge of outdoor furniture made the nicest part of the condo, the balconies, look cluttered. The two rocking chairs had broken backs. The interior was standard. The complex is old Sea Pines beachy. The water in this area is not suitable for swimming because of extremely strong currents, but it is lovely to look at, especially from the balcony. If you want basics and value, this Is a good pick. First, thank you for your input. I think the issue with the outdoor furniture is that guests keep moving it around. We try to keep it spread out among the three balcony areas, but sometimes guests congregate it to one balcony area. The report of the rocking chair backs is disconcerting. I replaced these chairs, that were formerly wood, with plastic rocking chairs. I am having maintenance look into this. The interior of the condo has previously gotten accolades, so I am not sure what the issues are here. I redid the bathrooms with a walk-in shower in the master not long ago. I will review this and all other aspects of the condo when I go down next month. As for swimming, I have not tried to swim in the ocean. The swimming pool in the complex has been sufficient for my needs. You are correct. The water is lovely to look at, along with the dolphins, deer and other wildlife. I hope you have a wonderful future vacation here. First stay in South Beach after decades of vacationing in HHI - loved it! We are a family of five and have vacationed in Hilton Head almost every summer. Our oldest child is twenty now, and I vacationed in HHI as a child myself, so I have spent lots of time here! I have always stayed on Sea Pines, usually in the Night Heron community. South Beach was a very pleasant experience and opened our eyes to more of the island. I was worried that it would be a congested and noisy area, but it was quiet and peaceful. We could easily walk across the street to the marina, which was fun, and the beach and pool are very close. This section of beach is different from the Atlantic side. We saw so much wildlife off of our deck, which was amazing. Deer fed frequently in the dunes; countless numbers of dolphin swam by, flipping their tail fins, one even jumping completely out of the water; and I spotted one sea turtle in the water. We love the quiet, natural environment. The sunsets are beautiful, and it's nice to look across the water and see Dafuski island so close. There were elements of being on the Atlantic side of the beach that we missed. Swimming here was a little different, with the stronger currents, but we never felt unsafe. We did not boogie board, as usual. You do have access to the Atlantic portion of the beach, either through the beach club, or a 10-15 minute walk down the beach (which we chose not to do, lugging too much stuff). We also did not use the beach club, as we prefer quieter areas. Overall we felt that the Atlantic beaches are possibly more conducive to traditional beach recreation; however, we thoroughly enjoyed this area where the Atlantic meets the Calibogue Sound, and we will return. It is a very unique part of the island, and offers quiet and beautiful days and evenings at the beach. Additionally, this unit has beautiful views of the water. It is high enough to elevate your line of sight over the dunes, but low enough to not be looking into the treetops. It's perfect. The unit was always quiet, and extremely clean when we arrived. We received top notch care from the Sea Pines welcome center. They are the most courteous people I've ever encountered. We struggled with one of the shower faucets, and they were extremely patient and polite in walking us through figuring out the mechanism. We did not see a single Palmetto Bug, which I have always seen in the numerous places I've stayed over the years. We did not miss them! The beds were comfortable and the kitchen and bathrooms spacious. Wonderful trip! South Beach is a unique part of both Sea Pines and Hilton Head Island. It is, as you described it, the southernmost tip of the island. No one comes here passing through to go somewhere else, This results in the quiet and slower pace, even in the crush of summer visitors. You captured the trade offs in being on the Atlantic beaches further up the coast and here perfectly. Watching the deer, dolphin and shrimp boats and birds go by, see the ships entering and leaving Savannah Roads, is all there. At night, with its minimal lighting, you can see the stars. I look forward to accommodating you on your future trip to Hilton Head and Sea Pines. Thank you again for sharing your experiences. South Beach Properties of Hilton Head, LLC. Great condo and great location. I am glad you enjoyed the stay. I hope to see you next year. The condo is spacious and comfortable. We had a wonderful time. The view of the ocean/sound is beautiful with dolphin and big ships going by. On our last morning there were four deer right in front of our condo in the dunes. Awesome location and beautiful condo! We take our family vacation every year in Hilton Head and have always stayed in Sea Pines but never in South Beach and we absolutely loved this condo! It was fully stocked with everything we needed! 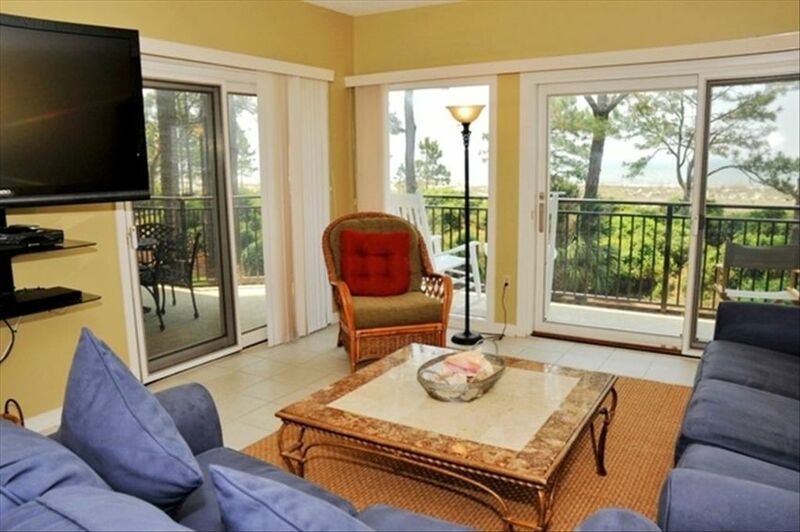 Had a nice deck with a view of the ocean from both bedrooms and the living room. I liked that there was a table with 4 chairs for eating and enjoying morning coffee, in addition to a few rocking chairs and other chairs and side tables. It's a short walk to the pool and the beach. The condo was very large and spacious! Both bedrooms were huge! The master had a desk also, which was nice. The other bedroom had 2 beds making it great if you have kids and both bedroom shave huge TV's as well as the living room! We love the layout of the condo and the fact that the kitchen overlooked the breakfast area and living room. Another nice feature is as soon as you get off the elevator to the 2nd floor the condo is right straight ahead! The Salty Dog restaurant and shops are right across the street as well as bike rentals. If you want to go to the main beach at the Sea Pines beach club, it's a very short drive there. I am hoping we will be able to rent this same unit next year for our annual trip! The weekly rate is five times the daily rate. In effect, if you stay five nights you get the next two nights free., if available. Rates are for up to six people. Larger parties not allowed. Beach Season Rates are for weekly only, Saturday-Saturday. Make final payment at the Sea Pines front desk at check-in.